Tokyo is busy. Seriously busy. With arguably thirty million people living within commuting distance of Shibuya Crossing, there are not many places on the planet that so many people call home. But right in the centre there are small oases of tranquility and one of those is the Asakura House in Daikanyama. 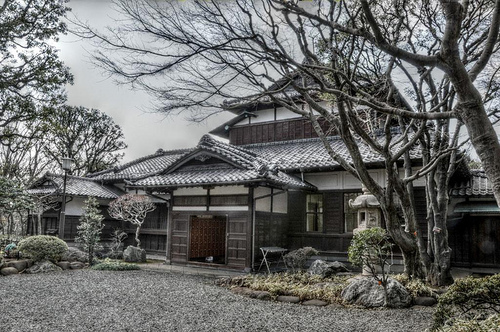 Built in 1919, it's survived the Great Kanto Earthquake of 1923 and the days of the Pacific War. Not too shabby for a hundred year old wooden structure. Granted its struggles were in its younger days. The interesting thing about Tokyo though, is that there is a lot to do but not actually that much to see. The city at night is a stunning array of light but during the day it's a pretty big piece of concrete. Think of London and immediately Tower Bridge, St Paul's and Big Ben come to mind. New York you've got The Empire State Building and Central Park. But Tokyo? Arguably one of it's most iconic centres is the Tsukiji fish market (and that's about to close its doors to relocate to a new home). Tokyo is an awesome city with hidden gems around every corner. If you want to listen to good old vinyl records you are genuinely spoilt for choice. Near where I live there is a library where you can order a beer. At 3.00AM! And even closer there is a bar where the husband and wife owners compete with each other over who know's 1970's rock better than the other. But if you would like just a little bit of down time, the Asakura House will set you back a dollar. And you can sit and watch life go by.